With the success of Paul’s desire to impose his vision for the Church, the true teachings of Jesus--as preserved by his family and disciples--were forced into hiding. This clandestine movement was evidenced by such early groups as the Nazarenes, Ebionites, and Elkesaites but is generally thought to have died out when the Church of Paul branded these groups as heretics. However, despite the ongoing persecution by the Roman Catholic orthodoxy, this underground Jewish strain of Christianity was able to survive and resist incorporation into its more powerful rival. Jeffrey Bütz, author of The Brother of Jesus and the Lost Teachings of Christianity, reveals for the first time the hidden theological link that connects James the Brother of Jesus and the Ebionites with the religion of Islam, the Cathars, the Knights Templar, and Freemasonry. 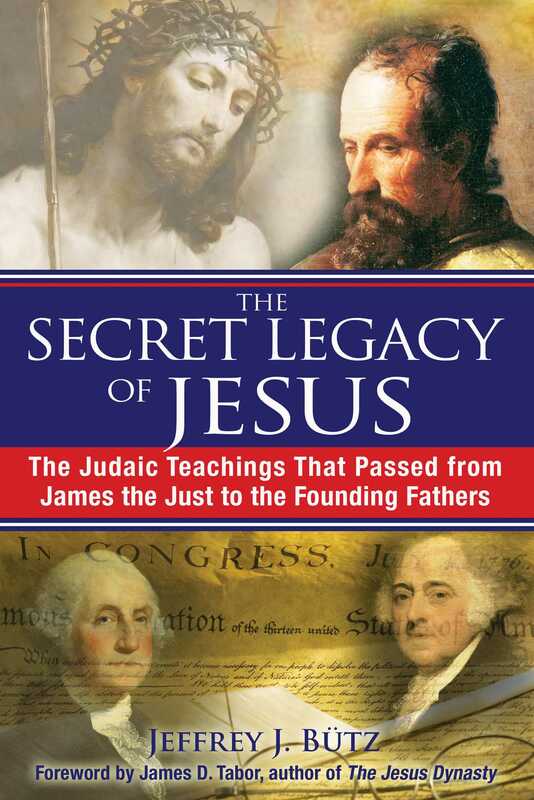 In The Secret Legacy of Jesus, Bütz demonstrates how this centuries-old underground stream of Christ’s original teachings remained alive and how it surfaced again in Colonial America, where the Founding Fathers used Masonic principles rooted in Jewish Christian teachings to establish what they believed would be a “New Jerusalem.” With the rise of a fundamentalist Christianity, this potent spiritual vision was lost, but Bütz contends it can be recovered and used to bring about the reconciliation of Christians, Jews, and Muslims throughout the world. I have other sheep that do not belong to this fold. I must bring them also . . . I need to make the disclaimer right up front that while I am not myself a Freemason, I have had a long-standing interest in Freemasonry and have done quite a bit of research into its historical origins over the past twenty-five years. I have come to the conclusion that there is a definite link between the theology of earliest Jewish Christianity and the rituals and teachings of Freemasonry. I posit that Freemasonry has somehow preserved in its rituals and teachings the core essence of Nazarene and Ebionite theology. One of the most obvious pieces of evidence for my claim is that, for a group that was founded by Christians and still today has a large Christian majority, belief in the divinity of Jesus is not a requirement. There is nothing in Masonic ritual that a Jew or Muslim would find offensive. In fact, Freemasonry is one of only a few international organizations that welcomes people of all religions. The only requirement to be a Freemason is that one believe in a Supreme Being. However, one is never asked to declare what their particular beliefs about the Supreme Being are. The Supreme Being can be understood as Jesus by a Christian, as Allah by a Muslim, or as Brahman by a Hindu. In its rituals and writings Freemasonry refers to God in neutral terminology as the Great Architect of the Universe. Today there are approximately five million Freemasons in the world and Freemasonry is found in almost every nation, though it is telling to note that Freemasonry is outlawed in many Muslim nations for being a Zionist organization. Some radical Muslims argue that Freemasonry promotes Jewish interests around the world and that one of its aims is to destroy the Al Aqsa Mosque so that the Temple of Solomon can be rebuilt. The generally accepted definition of Freemasonry among Freemasons is that it is “a system of morality veiled in allegory and illustrated by symbols.” In pursuit of this ideal, Freemasonry, which is commonly referred to by Freemasons as the “Craft,” uses the symbols of masons’ tools, such as the square and compass, as part of an allegorical retelling of the story of the building of King Solomon’s Temple, meant to inculcate the building of straight and upright moral character. In Freemasonry, as in Jewish Christianity, deeds are more important than any particular expression of faith. “What good is it . . .if you say you have faith but do not have works? Can faith save you?” (James 2:14). The first question a new candidate is asked in the entrance ritual for the first degree of Masonry is this: “In whom do you put your trust?” The prescribed and only accepted answer is: “In God.” To answer “Jesus” would not be acceptable. The candidate is later asked by the Worshipful Master, “From whence come you, and whither are you traveling?” At this point the Senior Deacon answers for the candidate, “From the west, and traveling toward the east.” The Worshipful Master then asks, “Why leave you the west and travel toward the east?” The prescribed answer is, “In search of Light.”3 It is interesting that the Letter of James refers to God as the “Father of lights, with whom there is no variation or shadow due to change” (James 1:17) and the favorite gospel of the Cathars, the Gospel of John, calls Jesus “the true light” (John 1:9). The questions and answers that are the first part of Masonic initiation exhibit Jewish-Christian and Gnostic theology, not necessarily orthodox Christian theology. But how did Jewish-Christian theology make its way into Freemasonry? I believe it came through the Knights Templar who had been uniquely exposed to both Cathar and Muslim theology. We have seen how a Gnostic form of Jewish-Christian theology came to be preserved in Catharism and how this influenced the Knights Templar. I believe the main connecting link between the Nazarenes, the Templars, and Freemasonry is the Jewish temple. The Temple was the focal point of the Nazarene community under James. The Temple was where the Nazarenes continued to worship, and it is where James was martyred. The Temple remained the center of Nazarene worship not only because of its historical and religious significance but especially because it was the site of the expected Parousia of Messiah Jesus. One obvious connection between the Templars and Freemasonry is that the original group of nine Crusader Knights from France took the name “The Poor Fellow-Soldiers of Christ and of the Temple of Solomon.” All Masonic ritual is centered on the building of Solomon’s Temple, allegorized as a spiritual temple. In Masonic ritual and symbolism the pillars of the Temple play a central role. I do not believe it is coincidence that James, Peter, and John were referred to even by Paul, who was often at odds with them, as the “pillar apostles” (Galatians 2:9). Jeffrey J. Bütz is an ordained Lutheran minister and adjunct professor of world religions at Penn State University's Berks-Lehigh Valley campus. He lives in Catasauqua, Pennsylvania. "While evidence for an unbroken tradition is tenuous at best, Bütz's book provocatively reminds readers of the persistence of non- and even anti-Pauline types of Christianity; for spiritual seekers, scholars, and open-minded Christians." " . . . a pick for any spirituality collection including secret societies and Christian history." "Butz has uncovered details that other authors have missed . . .